OpenWay Group has been supporting the Indonesian payment leader ever since Finnet migrated to the WAY4 Switch platform nearly a decade ago. In 2015 Finnet achieved 34% annual growth in transaction flow. The year was also remarkable in terms of revenue, achieving 150% growth compared to the same period in 2014. PT Finnet Indonesia was established in 2005 as a subsidiary of PT. Telkom Indonesia, Tbk (TELKOM), the country’s largest telecommunications company. Finnet runs three lines of business: a bill payment aggregator, an electronic payment platform and online payment solutions. Today the company is central to the national payment ecosystem, with all the major banks, billers, e-money issuers and non-bank payment providers in Indonesia connected to Finnet. In 2015 Finnet achieved 34% annual growth in transaction flow. The year was also remarkable in terms of revenue, achieving 150% growth compared to the same period in 2014. Soon after Finnet was established, the company realized that legacy transaction switches could not fully support its strategy of “becoming the leading Indonesian and global-scale service provider of electronic payment systems”. Most solutions on the market were just back-end systems relying on XML protocol. Finnet required an innovative payment switch platform with powerful messaging, high availability and a modern mechanism for seamless integration and building online interfaces between information systems. The migration was accomplished swiftly by the vendor’s team in 2006. Since then Finnet has been profitably developing the WAY4-based part of its business. The low TCO of the new switch has allowed the company to compete on pricing with banks. Today Finnet serves and connects over 60 financial institutions and 20 billing companies on WAY4. Finnet recently decided to replace two other legacy systems with WAY4 in order to further reduce the costs of maintaining its payment processing infrastructure. Indonesia’s GDP is on the rise, and so is consumer spending. The unique geographic spread of the population explains the strong demand for branchless financial services. The popularity of online and mobile payments is growing, additionally fueled by the Government’s desire for a “cashless Indonesia”. The Indonesian payment ecosystem is transforming. In addition to banks, telcos, billing companies and payment gateways, there is an increasing number of e-money issuers and other non-bank financial providers. The market requires interoperability between all the payment industry players, and here lie rich opportunities for Finnet. In 2015 Verifone, Finnet and Telkomsel launched “TCash Tap” – NFC mobile payments in retail stores. Finnet’s role is to provide mobile user access to Indonesia's banks nationwide, facilitate interbank connectivity, and support a wide range of payment types and acceptance options. Finnet believes in the future of such projects, and in the benefits of introducing payment innovations of its own. To celebrate and support Finnet’s ten-year run of success, OpenWay and its partner Metro Asia Pacific ran a workshop in Jakarta for the Finnet team. The participants discussed payment trends, both global and those specific to Indonesia. OpenWay presented the WAY4 product roadmap, and its most recent innovative solutions – WAY4 HCE, WAY4 Wallets, WAY4 Shop, and WAY4 High Availability. 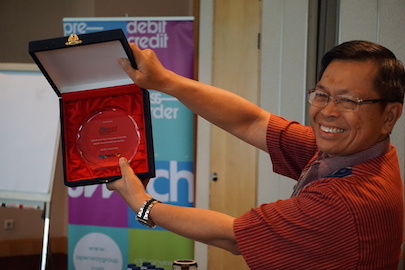 In spring 2015, OpenWay, a recognized leader in software solutions for bankcard issuing and acquiring, payment processing, and omni-channel, and Finnet, one of the leading electronic payment platform and online payment solutions company in Indonesia, celebrated 10-year anniversary of the successful partnership. 10-years history of the partnership was marked by some significant results. Now Finnet uses the WAY4 platform for transaction switching between more than 60 banks and 20 billing companies. The WAY4 Switch has already replaced one switching platform in Finnet and been selected to replace two switching platforms more. WAY4 is to support 120,000,000 transactions in 2015. Finnet plans to grow significantly in transaction flow on WAY4 further. Erman Suherman, Operation, IT & Innovation Director, Finnet, said: “We are completely satisfied with OpenWay as a partner and its innovative product WAY4 as a switching solution. We chose WAY4 for its flexibility, modularity, and cost-efficiency. During these years OpenWay proved to be a reliable and supportive partner”. As a part of this partnership OpenWay and its partner Metro Asia Pacific organised an anniversary workshop for the Finnet team. During this workshop the participants shared the latest trends of the world payment industry and discussed the opportunities in the Indonesian market. OpenWay presented the WAY4 product roadmap, and its innovative products - WAY4 HCE, WAY4 Wallets, WAY4 Shop, and WAY4 High Availability.